Former head of the Fine Arts Sector Mohsen Shalaan passed away on Sunday afternoon at his home in Cairo's Dokki district, Gallery Misr head Mohamed Talaat has confirmed. The cause of death has not been announced. He was 63. Shalaan was born in Cairo on 14 April 1951, and received his BA in Art and Education in 1974. He held several positions at the culture ministry, the last of which was his appointment in 2006 as head of the Fine Arts Sector, a body responsible for several art institutions and museums. He was sacked from the job in 2010 over the theft of a multi-million dollar painting by Dutch post-Impressionist Vincent Van Gogh. The Poppy Flowers painting was being displayed in the Mohamed Mahmoud Khalil Museum in Dokki, home to one of the most significant collections of 19th and 20th century European art in the Middle East. He was found guilty and sentenced a year in prison on charges of negligence and incompetence in the performance of his duties in relation to the theft. Shalaan's work was acquired by a number of international and local museums, such as the US Congress Library museum in Washington, Al-Ahram newspaper, the Cairo Opera House, the Goethe Institute in Cairo, among others. He also supported Egyptian artists, and tirelessly worked to set up a museum for renowned Egyptian artist Inji Efflatoun at the historical Amir Taz Palace. Shalaan also worked to restore various rundown cultural venues in Egypt, including the Aisha Fahmy Palace, the Rateb Sedeek Art Gallery, and the 1952 Revolution Heroes Museum, as well as the Mohamed Mahmoud Khalil Museum. He exhibited his artwork numerous times in Cairo. 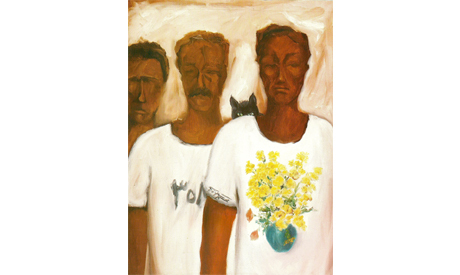 His last exhibition, Black Cat: A Prison Experience, was held one year ago at the Gezira Art Centre and showcased the artwork he created during his year in prison.